Bright and beautiful 1 bedroom historic condo with great walkability! High ceilings, large windows and hardwood floors provide a light, spacious feel. Leafy views will greet you in the summertime. Kitchen features maple cabinets, beautiful countertops and subway tile backsplash, with sunny eating area and closet pantry. Spacious living room offers plenty of light from two large windows, hardwood floors, high ceilings, access to walk-in closet and opens to adjacent dining room. Bright bedroom with hardwood floors, tall baseboards, ceiling fan and a walk-in closet with shelving and Elfa storage system. Charming bathroom with tub/shower, tile backsplash and penny tile flooring. Two additional closets in the unit and a storage unit in the basement. Convenient rear access from the kitchen leads to basement laundry, basement storage unit and rear shared patio for easy entertaining. Very walkable and a bikers paradise. 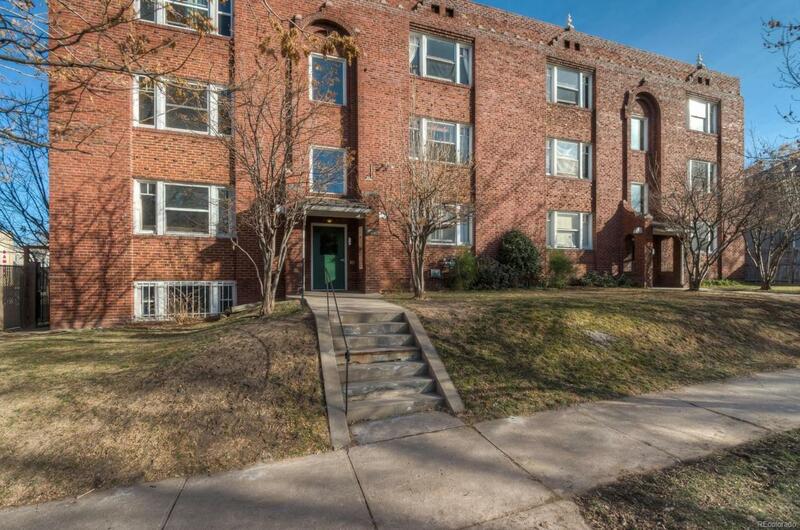 Walk to Cheeseman Park, downtown, immediate access to bike lanes, trails.